certificate silts are available free of charge. This promotion may be used with other valid promotions (including those found on external websites). 1 foil stamped area on Side 1 of uncoated 100lb Sterling Gray Linen stock. Thick vertical letters in Metallic Sapphire foil attract the eye right away. Gray stock creates a brooding look that portrays rock music's dark tones and complements the sapphire's glitz and glam. Inside, Verizon Wireless employees can place a photo of themselves competing in the cellular retailer's Rockstar Competition, an in-house contest to find the best sales associate and reward them with the grand prize: a week of living like a rockstar. 1 foil stamped area on Side 1 of uncoated 100lb Eggplant Linen stock. Rich eggplant stock evokes notions of wealth, royalty, and school pride for Kansas State University. 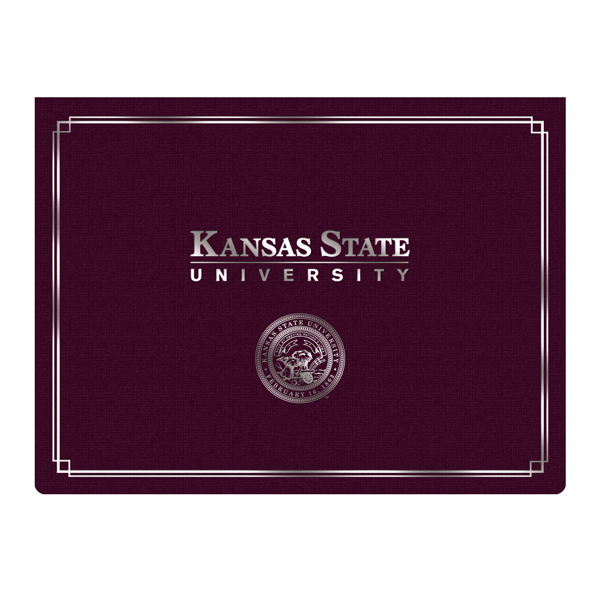 Metallic Silver replaces the white in KSU's colors with a glamorous shine worthy of any awards ceremony. Within the decorative border are the school's name and official seal, which give the cover a simple, classy feel. Slits on the right inner panel grips a certificate diploma, or photo by its corners. 1 foil stamped area on Side 1 of uncoated 80lb Spruce Felt stock (currently unavailable). Reflective silver letters give a metallic shine to this cover for Verizon Wireless. Their glamorous look is worthy of a rockstar—or in this case, the winner of Verizon's annual Rockstar Competition. Teal panels add a simpler element to keep the design down-to-earth. Four slits on the right panel hold the winning sales associate's photo to commemorate their achievement. 1 foil stamped area on Side 1 of uncoated 80lb Leaf Green Vellum stock. 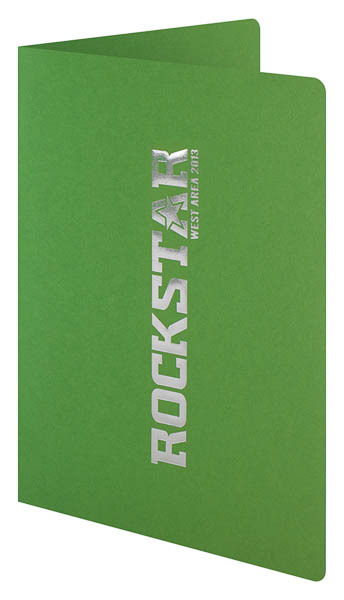 Leaf green stock and glittering silver foil make for an eye-catching design. 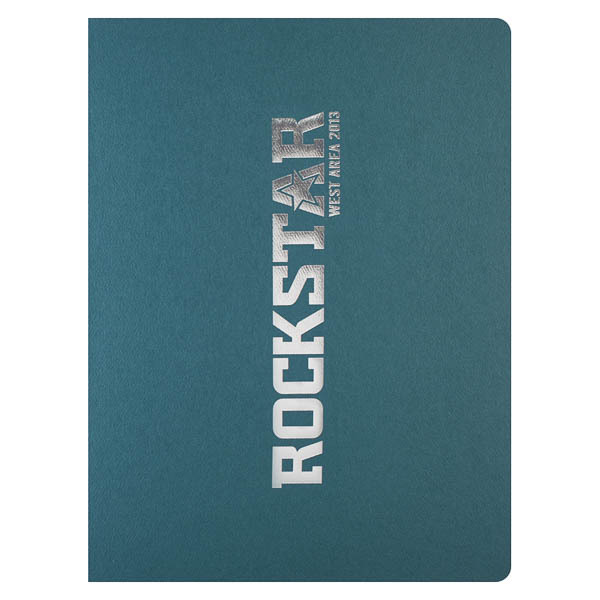 The word "Rockstar" appears vertically on the cover; its thick slab serif letters are bold and edgy, suggesting both glamor and innovation. Designed for Verizon's annual Rockstar Competition, four interior slits hold the winning sales associate's photo. 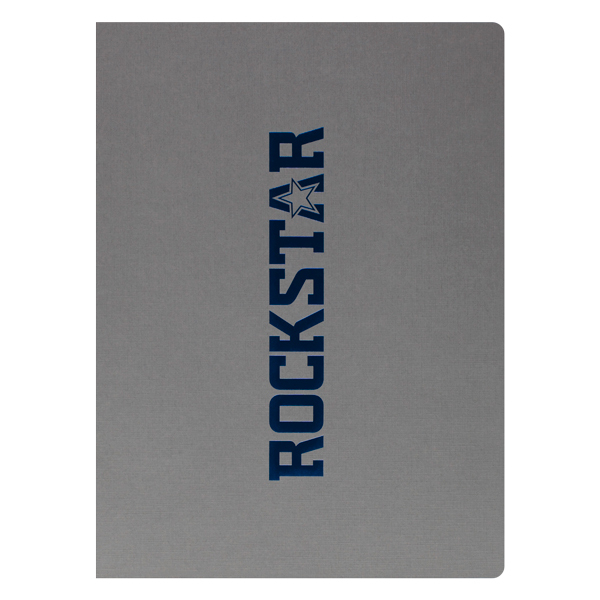 This lets them commemorate their prize—a week of living like a rockstar—for years to come. Four interior notches securely hold an 11" x 8 1/2" certificate with minimal coverage. The closable cover protects the certificate from bending or wrinkling. The landscape-oriented panels offer an array of design options, such as wide images or an embossed or foil stamped logo. Recipients can also turn the design to a portrait orientation to display a vertically aligned certificate. Dimension Open: 12" x 18"
Acceptable Insert Sizes: 8 1/2" x 11", 8" x 10"